By admin in School Developments on November 8, 2018 . 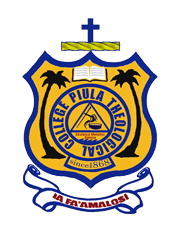 Last month, Piula Theological College was entered into a national competition of Marine Reserves and Wildlife habitats. Such competition was held in Apia on the 25th – 26th October, which was attended by our Dean of Studies Rev. Dr. Sanele Lavatai along with some of the students involved in the marine reserve committee. Piula came first place in the national competition of Marine Reserves and came Second place in the Oyster Reserve Maintenance.